Inexpensive and versatile ChemDBsoft could be the most user-friendly software for keeping, editing, and sharing e-records of your entire chemical inventory. ChemDBsoft equally effortlessly and accurately works for just a handful of records or for a databases size of several million structures. Its interface is similar to a Word document one and requires no training to start creating databases. ChemDBsoft is compatible with the latest Windows versions and you can choose from three software package options to suit your lab and office needs. 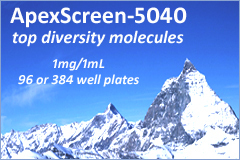 ChemDBsoft Light is ideal for very small to medium chemicals inventory and can manage up to 50,000 structural records. Light version has a lot of functionalities in common with the full, Standard, version. A user can create multiple databases and specialized fields within those databases, including ID-number, text, and numerical fields. Entering chemical structures is very easy with over 70 handy templates and advanced structure editor. Besides, structural drawings can be copied and pasted, imported in SDF, and exported in Excel, mol, sdf, txt, lst, and other formats. In other words, ongoing updates and data sharing with your colleagues and vendors is fast. 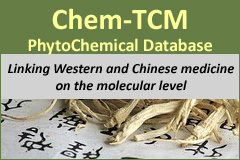 The software allows you to enter multiple fields for one chemical record to keep track of all information related to the structure. It is possible to search across the fields within one or more databases. Structure field search allows the entire structure, substructure, fragment, or a functional group input. Any search results subsets can be exported in a separate database. What is more, a user can insert any type of document into a database (into an object type field) and insert images as well. ChemDBsoft V3 Standard is capable of managing nearly unlimited in size databases and is meant for very large chemical inventory. The database is very efficient when it comes down to computing resources -a million records take up to under 1GB. Standard version does structure comparison between databases and has advanced search, import and export functions. For example, Standard version recognizes tautomers, can remove or add salts from or to the structure fields, enables synthesis planning, and has SMILES support. 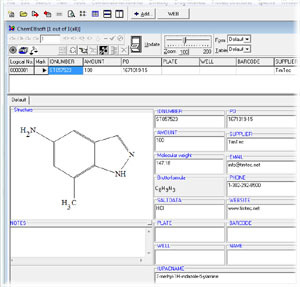 ChemDBsoft V3 Standard is a powerful platform for add-on modules for chemical-physical properties calculations and predictions for drug discovery. A note for our current ChemDBsoft users: Updated and more capable Version 3 (V3) is now available. V2 still remains operational and upgrade can be done on request to enhance existing functionalities and add some new features. Contact us with your inquiries and for the list of software features to match them to your needs. We are available for tech support before and after sales.